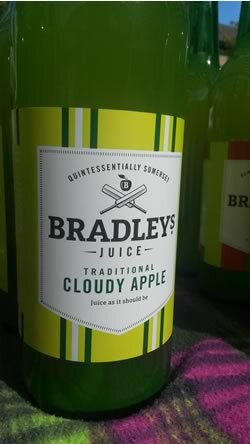 Bradley’s Juice is a family run business, producing outstanding English juices at Box Bush farm in rural Somerset. We specialise in producing the most fantastic single variety apple juice using only the very best hand picked apples. Our juice is made in small batches and pressed at Box Bush Farm using traditional methods of production. We believe the fruit we use is what you should taste so we never add any chemicals, preservatives or concentrates – our drinks are all natural. Once the juice has been extracted from the apples, we leave it to settle following which we bottle it and gently pasteurise it so that you can enjoy our fruit juice all year round. Address: Box Bush Lane, Nr Huish, North Somerset. This entry was posted in Drinks, Midsomer Norton. Bookmark the permalink. Both comments and trackbacks are currently closed.